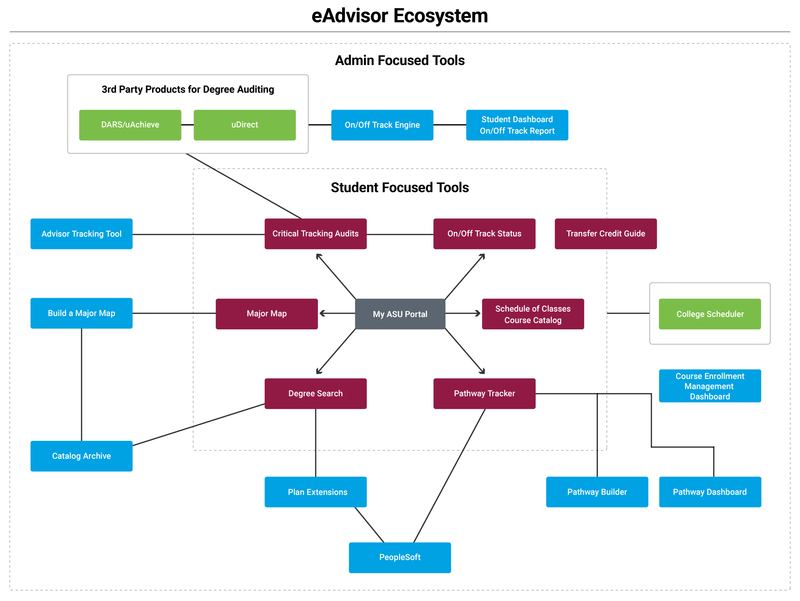 Detailed information on the eAdvisor™ suite of online and interactive tools, inspired by the most commonly asked questions and requests for information from institutions of higher education across the U.S. and the world. eAdvisor™ is a suite of online and interactive tools designed to support student retention and success by monitoring student progression toward degree completion and providing needed interventions at strategic times. ASU is continually striving to better meet the needs of students by using student data to provide relevant tools and services. Some eAdvisor™ tools are built using purchased software, and some are home-grown software arising out of needs that are being unmet by available software. PeopleSoft houses this tool that Academic Advisors use to review students who are off-track, as well as to interact with the tracking data. The tool can be used to change a student’s track status, put a student on track by override or otherwise adjust a student’s tracking data appropriately. The PeopleSoft modification was built by ASU. ASU-built system that manages the creation and maintenance of curricular maps for undergraduate majors, minors and certificates. Departments and colleges document major, minor and certificate curriculum, which is then reviewed by the Provost’s Office and posted to Degree Search. Critical requirements are designated on major maps, and these maps are used to communicate the critical requirements to students as well as inform critical tracking data. The system has the ability to roll existing information to a new academic year to make yearly reviews and changes easier. The Catalog Archive is the archival record of the university’s Academic Catalog, published by academic year. The Academic Catalog comprises data from Degree Search, including curricular maps and transfer pathways, as well as college and university policies and the course catalog. An ASU-built application is used to pull information from Degree Search for the archive. College Scheduler is a third party tool, which ASU has integrated into My ASU. It reads the course catalog, schedule of classes and students’ DARS critical tracking audit to suggest appropriate next term courses and schedules. College administration and planning analysts use this dashboard to forecast how many seats are needed in courses each semester. This ASU-built tool reads critical tracking course requirements and identifies the needed course for the subsequent semester in order to make this forecast. This allows classroom schedulers in a college to know how many students from another college require their course the next term so they can plan appropriately with regards to faculty hires and other resource needs. Critical tracking audits mirror the sequenced curricular requirements from the eight-term major map and contain all the requirements from the graduation audit. Critical tracking audits are built in DARS/uAchieve and provide foundational data for the eAdvisor Critical Tracking process. These CollegeSource products are used to create degree audits, including the graduation audit and the critical tracking audit. Graduation audits are used by the Graduation Office to confer degrees. SelfService is the program used to display the audits in a readable format and provide them to students and advisors. uDirect is the tool that sequences the graduation audit requirements by term. Degree Search and the curricular maps serve as the university’s official record of available majors, minors and certificates and their associated curricular requirements. It also serves as a primary marketing arm for the academic programs and features diverse search options for students to explore, including campus, college, skill sets and career opportunities. This tool was built by ASU. A major map is an eight-semester, optimal course plan that outlines a recommended sequence of courses, enabling full-time students to graduate in four years. Major maps are created in Build a Major Map (BAMM). My ASU consolidates important information for students, such as finances, class schedules, priority tasks, academic tracking and support services into an easily navigated experience. This tool was built by ASU. This tool is where the logic for on/off tracking is processed. It evaluates the student by track term, comparing completion status of the requirements in the critical tracking audit against the student’s academic record to determine the student’s tracking status. This tool was built by ASU. The purpose of Critical Tracking is to identify critical predictors of success in a major. This may include completion of specific courses, achieving a GPA or completion of a non-curricular milestone. Students are assessed against all critical requirements in their current track term and in previous track terms, until they complete all of the critical requirements identified in the first four terms of the major map. This assessment identifies students who are struggling so that appropriate advisement and intervention can occur, which may include placing holds, dropping classes or encouraging the students to potentially change their major, if deemed appropriate. Students who do not complete critical requirements in their major map are considered to be off-track. Pathway Builder is a tool that allows for curriculum collaboration internal and external to ASU. The tool allows ASU to build the first 60 credit hours of an ASU major using in-state community college course equivalencies (which are pulled from uAchieve). It allows multiple users from the ASU college level, Provost’s Office and external community college partners to review and approve the curriculum. This Maricopa to ASU Pathway Program (MAPP) is an example of the finished product. The Pathway Dashboard has been created as a tool for administrative entities to have a quick, reference view of students who have signed a Pathway Agreement at the community college and are somewhere along the pipeline to attending ASU. Once criteria have been selected, there are drilldown opportunities to research down to the individual student level. The intent of this dashboard is not to provide detailed information about students once they are admitted to ASU. This is a personalized tool for students who have signed up on a Maricopa to ASU Pathway Program (i.e. transfer agreement). Once the student has signed a transfer agreement, the Maricopa County Community College District sends transcripts as students progress through their coursework. The courses are loaded into the student tracker, and students can clearly track their progress towards completing their transfer pathway and their eventual transfer to ASU. ASU uses Oracle PeopleSoft as its Student Information System (SIS). All official student record information, as well as academic structure, program and course information, and enrollment is housed in PeopleSoft. All ASU tools are integrated with PeopleSoft. Academic Plan Extensions is an ASU-built PeopleSoft bolt-on which houses academic program information, including Degree Search program descriptions, program contact information and major career data. The Course Catalog shows detailed information about courses. The Schedule of Classes/Class Search displays class availability in any given term. Students are able to register for classes directly from Class Search. The data for both the Course Catalog and Schedule of Classes is housed and managed in PeopleSoft but displayed to students and the public through ASU-built web applications. This reporting tool allows ASU administrative users to view and analyze tracking status data at an aggregate level as well as filtered by categories such as college and major. The Transfer Credit Guide is a search tool which includes 500,000+ course equivalencies from regionally accredited domestic and international post-secondary institutions, educational experiences completed during military service (via the Joint Service Transcript) and standardized exams (e.g. AP, CLEP, Cambridge, DSST). The tool allows students to submit coursework to see how credits will transfer to ASU. The My Transfer Courses page allows students to view saved course and exam searches, courses submitted for evaluation, and courses evaluated from an official transcript.